Sat., March 24, 2018, 8 a.m.
My wife, Kathy, thinks I’m nuts. I talk to people on elevators. Talking to strangers is interesting to me, and I believe that’s one reason I jumped at the chance in 1994 to host a two-hour, call-in home improvement radio show in Cincinnati. Each week homeowners would call in and ask me for help. I thrived on the friendly back-and-forth and the challenge of answering their questions live on the radio. The show lasted for 12 years before I hung up the headphones. A month ago, a good friend of mine reached out and said that I should get back in front of the microphone, but offer the helpful service to homeowners all over the USA. “Tim, it’s time for you to start your own Ask the Builder podcast,” he said. Podcasts are on-demand radio. You get to listen to whatever audio content you want on your own terms. There are thousands of different free shows about every possible topic out there. You can download them to your smartphone, tablet or computer. I launched my podcast last week, and it was a blast. It’s only about 30 to 40 minutes long and the first one included two calls and a story about a mistake I made years ago and how I learned from it. You’ll discover how to save time and money with each story, no doubt! The first call on the podcast was with Jill. She had a throw rug in her kitchen in front of her dishwasher. That’s fairly common. My wife and I have one in front of our kitchen sink, and it’s wide enough that part of it extends in front of the dishwasher. Jill’s dishwasher developed a very tiny leak. The rug, however, kept the leak hidden from her because she wears shoes in the house and never felt the slightly damp rug. When she picked up the rug to wash it as she normally does, Jill saw the damaged hardwood floor. The problem was made worse by the fact that Jill’s hardwood floor extends into other rooms of the house, and she didn’t want to replace the entire floor. What a job that would be! Jill wanted to know if there was an easier fix. I recommended that she might think about cutting out part of the kitchen floor in front of the dishwasher and cabinets and installing a decorative border back away from the cabinets about 18 inches. A simple strip of wood of a different species would look fantastic to outline this area. It’s a design that reminds me of my youth. My aunt was a nun, and I remember as a small child going to visit her at the convent each Sunday. In the magnificent old home where the nuns lived the hardwood floors all had borders at the edges of the rooms. 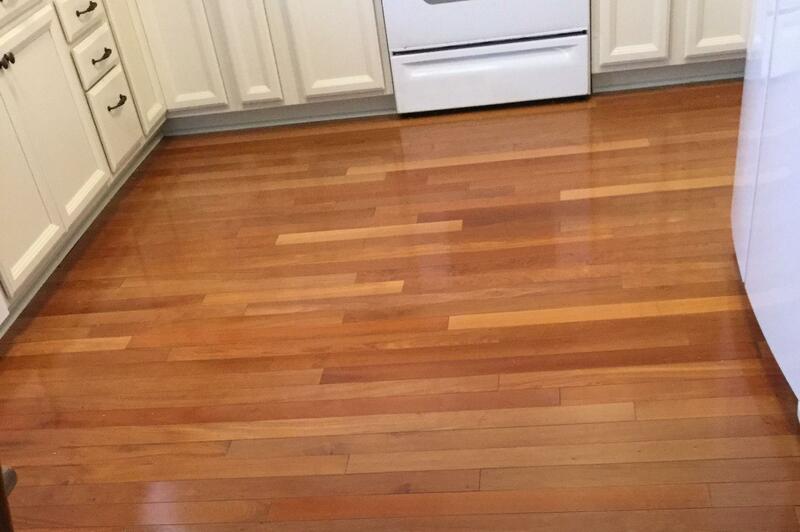 One benefit of installing a border, and then new flooring between the border and the cabinets, is that if there’s a leak again, just the flooring inside the border has to be replaced. I say this assuming the leak is caught in time. You may be interested in my second conversation. Greg and his wife are building a new home in San Tan Valley, Arizona, a suburb southeast of Phoenix. They both love the look and feel of hardwood flooring, but the builders in Arizona discourage it. The houses there are built on concrete slabs, and installing traditional 3/4-inch-thick hardwood presents significant challenges. The builders promote large-format porcelain ceramic tile. Greg wanted to talk through his options, and I laid out the pros and cons of each kind of flooring. Not only is the extra cost of hardwood an issue in that marketplace, but the probable lack of skilled labor to install hardwood is also a reason the builders don’t like to offer it. Their new home is going to have an open floor plan, a change from their current layout, and Greg thought that they had to stick with one tile design across the entire home. I recommended that he visit some large tile showrooms that have large areas of tile installed where you can see the flooring. I know of at least two stores like this where he’d be able to see tile floors that have borders, medallions and complimentary tile touching one another. My thought was that he could introduce stunning border tile to set off different sitting areas in the rooms. Different types of tile can create certain moods or compliment furniture or cabinetry in a room. If you want to hear these discussion – plus the personal anecdote, which I call “Humidity and the Black Goo” – go to my podcast page at https://www.askthebuilder.com/podcast. I promise you’re in for a treat! Published: March 24, 2018, 8 a.m.